Fitting this many people in one picture frame is more difficult than you would think, but this is a problem I like having. Although it’s technically been over a week, I would be remiss if I didn’t give at least a few of my thoughts about what turned out to be a terrific week. It goes without saying that this is now my fourth third week, but it’s only my second first week of the school year, hence the title and its accompanied parentheticals. It was awesome that even before school started, Hyde Park was having a jazz festival (as I think they do at a time that always coincides with O-Week) to interrupt the monotony of countless Target trips to buy just about everything I could ever need. On my very first day of school, Senator Bernie Sanders came and spoke in the same building that he graduated from 51 years ago, Rockefeller Chapel. Is it ironic that it is named after oil baron John D. Rockefeller, who also founded UChicago (calling it the best investment he ever made)? You be the judge of that. He gave what I imagine to be his standard stump speech, and changed it to provide some advice to UChicago students. As UChicago’s very own, Professor Charles Lipson (who happens to now be my Intro to International Relations teacher) pointed out, the dearth of applause when Sanders spoke about his support for Israel’s right to defend itself is a problem in and of itself (I had sensed that he was going to say something along those lines, so I stood up and cheered). Even though I agree with Sanders on virtually nothing, it was still cool to have him on campus for our very first day (I wrote more about his visit in The Gate as a response piece on behalf of College Republicans, that you can read here if you’re interested). 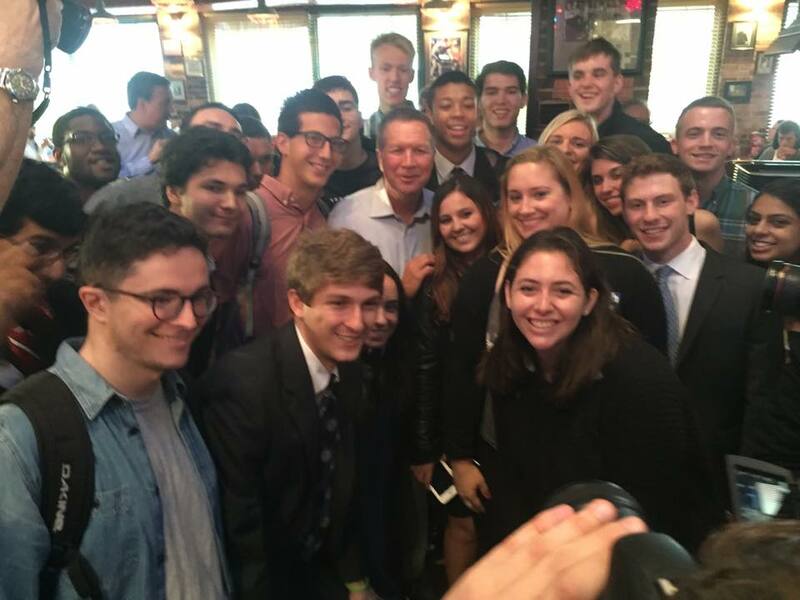 The following day, several College Republicans and I headed downtown to Portillo’s to meet Governor John Kasich, with whom we have a lot more in common in terms of ideology (although not in terms of higher education) that Sanders. Although we were barely able to hear what he had said to the crowd that was there, he did take a break after speaking…to have us all awkwardly watch him while he ate a hot dog, Chicago-style. After he had finished with his lunch, he did photos with the people there, including one with all of the College Republicans who had gone there, and after he gave us some life advice he gave us all a group hug. 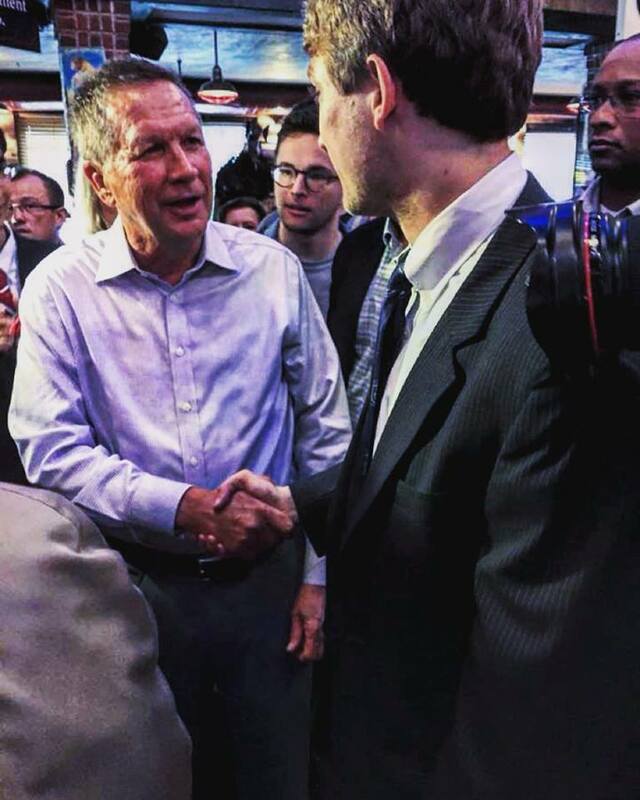 As great as the event was, I’m still 110% behind Marco Rubio, although Kasich’s stock did rise in my eyes. The fact that I was able to edit a photo that turned out this amazing looking is one of the many reasons I’m glad I went to the event (although watching Kasich eat a hot dog was a close second). On the next day, in addition to doing an immense amount of work prepping for our first CRs meeting the following day, two things of note happened: I took my laptop to the campus Tech Bar to see if they could decipher why it can only sometimes connect to the internet on very specific wifi networks. After 90 minutes and several restarts, they gave up all hope and said they had never seen a problem like this. That evening, I had been planning on going to the Five For Fighting concert that was on campus mainly because it was free and because it was so close I wouldn’t have forgiven myself if I hadn’t gone. 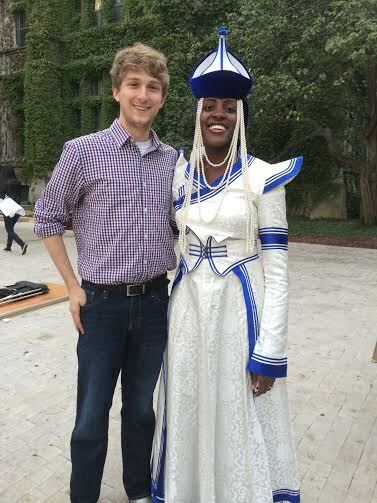 I was confused at first as to why UChicago was putting on a free concert, and realized over the course of the day that it was to culminate a day of celebrating the fact that the Pearson family had just donated $100 MILLION to UChicago to found both The Pearson Institute and The Pearson Global Forum. With a gift that size, I think we could afford to put on a concert for free. I also had great seats at it so that made it even better. I can't think of a better way to celebrate UChicago receiving $100 million to found The Pearson Institute for the Study and Resolution of Global Conflicts and The Pearson Global Forum than having Five For Fighting perform for us! "It's great to be here playing some songs you know…from middle school. Kanye was going to be here but he's too expensive." As far as I can tell, the Pearson family has zero connection to UChicago, yet they chose us because they were impressed by our “history of fostering an environment where rigorous inquiry is successfully applied to society’s toughest problems.” Not bad at all. 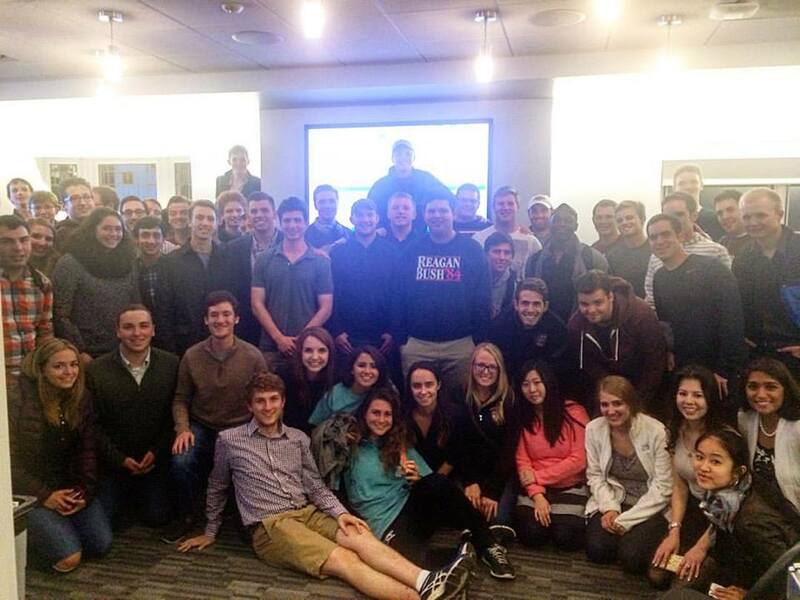 Thursday was the day I was waiting for: the first College Republicans meeting. I don’t remember too much before that because of how shocked I was at the turnout at the meeting. I arrived a few minutes before the meeting started and only a few people were there, but over the next 20 minutes or so there were so many people that we had to move to a different room for the first time in our history, as far as I can tell. We had 70 people there! For anyone reading this who is interested in going to meetings, they’re Thursdays at 7 at the IOP. 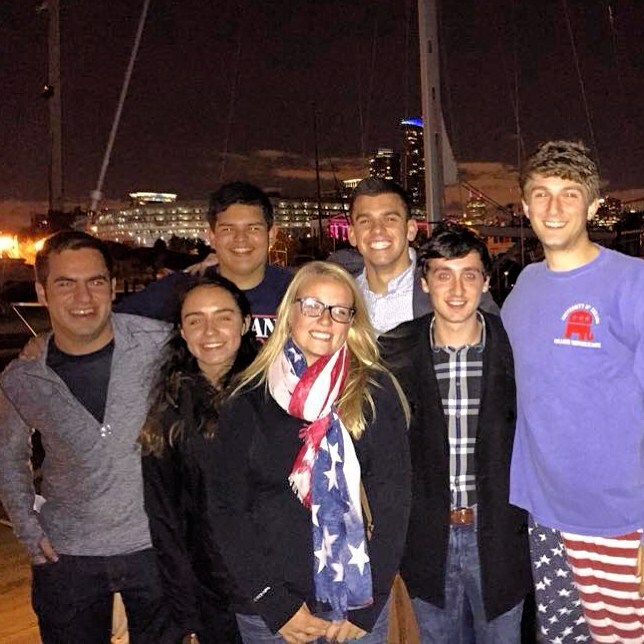 After the meeting, several of us headed downtown to a boat party with DePaul College Republicans, that was also a lot of fun (I don’t understand how it couldn’t have been fun, barring us having been on a boat named the Titanic). Boat Parties are as great as you’d expect. The only thing I had to wake up for on Friday morning was my 9:30 Chinese class, that I have every single day. After it was over, I definitely deserved a nap, but instead, I finished writing the Sanders response I linked to before (but if you’re too lazy to scroll up, here it is again) and then had a Registered Student Organization fair to represent College Republicans at…for 3.5 hours. The good news is that, while I wasn’t expecting too many new signups we had 40 new signups, which absolutely made it worthwhile. 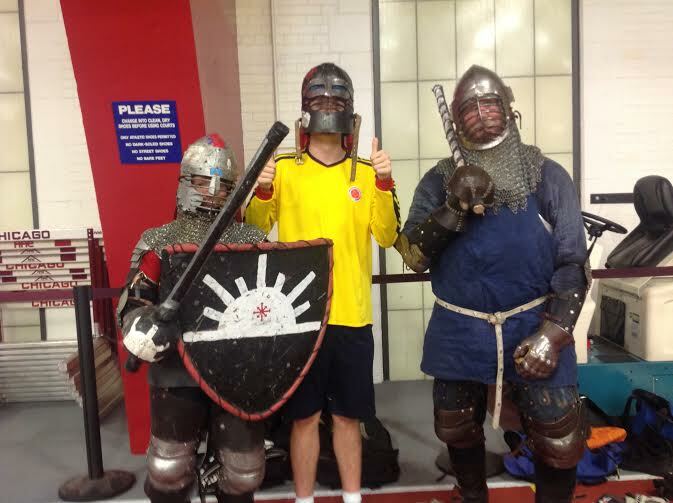 I remember meeting some interesting characters at this event last year, and even though I didn’t walk around too much this time, I did find a couple. My time at the RSO fair through the age (literally). The highlight of my weekend was absolutely a dinner downtown with some College Republicans that was noteworthy because I changed up where I ate and because of the company. The lowlight was, more or less (when I wasn’t running, but more on that later), the rest of it, since that was all spent either doing work or (more likely) thinking about how much work I should be doing). Finally, I have to admit to ignoring the advice I had previously given myself. The annual poster sale returned to campus today, and I had told myself to simply browse and buy the posters I liked subsequently online because they’d probably be cheaper, but I caved and bought one from The League and one from House of Cards (two solid investments). Now, every good story needs a villain, and mine is Comcast. As most people who know me know, I need internet to do a lot of things, so not having access to it in the room in which I live can be pretty annoying (even though my laptop is nothing more than a paperweight that can access Microsoft Office products, I have a phone and iPad). After the 3-5 business days that Comcast said it needed to ship the wifi modem, my roommate finally called them, and they told us that they hadn’t even bothered to ship it! That’s fine, we’re only paying them, right? Once it did arrive, it took forever to set up because it hadn’t been properly updated. True evil, I know. And there you have it. Hopefully you gleaned something other than how amazing the year to come with College Republicans is going to be!